Horse-drawn carriages have trotted along Chicago’s downtown streets for decades, but an ordinance making its way through City Council could outlaw that industry for good. An ordinance proposed by Alds. Brendan Reilly and Brian Hopkins would prevent the three horse-drawn carriage companies operating in Chicago from renewing their city licenses. Reilly said the move follows calls of animal cruelty from activists and his own concerns of increasing traffic congestion downtown. Cathy McFadden works for Antique Coach & Carriage in Chicago. 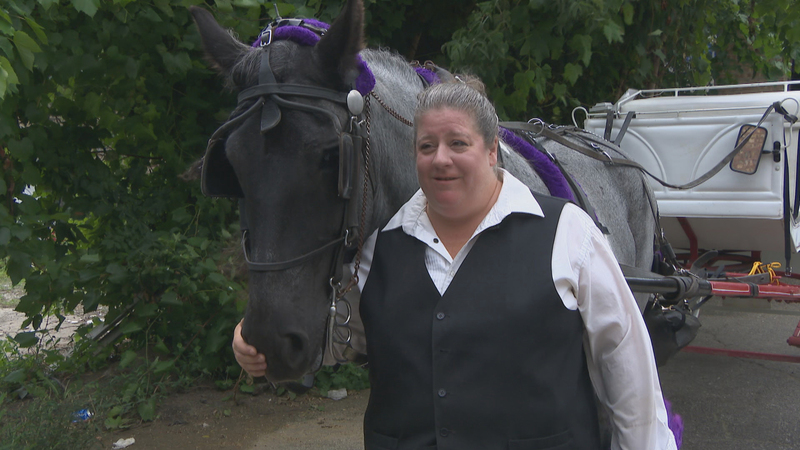 She’s operated horse-drawn carriages for 35 years. Municipal law forbids horse-drawn carriage companies from operating when temperatures exceed 90 degrees or go below 15 degrees. Horses also are not allowed to work more than six hours within a 24-hour period. Larry Ortega, owner of Chicago Horse & Carriage, says a horse-drawn carriage ban would erase a part of the city’s history. The proposed ban is currently in the Committee on License and Consumer Protection. Reilly said he and co-sponsor Hopkins hope the measure is taken up at the City Council’s meeting next month. Should Chicago ban horse-drawn carriages?